Now here's a twist. Asian film fans have long suffered the consequences of Hollywood remakes. With Hollywood content to get fat and lazy, film fans the world over were left to pick up the pieces. Nothing pleases me more than a twist in the tale. Connected is a remake of an American B-movie that wasn't too hot in the first place. Cellular entertained on the most primitive of levels and the concept was cool enough, but it was never going to push the boundaries of contemporary cinema. It's a film where Jason Statham and Chris Evans share top billing for Christ's sake. What were you expecting, Citizen Cane? Bob (Louis Koo) is a really bad father. He’s so wrapped up in himself that he never spares a thought for his son, a young boy headed to the airport with his aunt and out of his father’s life forever. Bob makes a promise to say goodbye. Bob had better keep that promise. That’s when he receives a phone call out of the blue. A stranger called Grace (Barbie Hsu) claims that a mysterious kidnapper is keeping her hostage and begs him to save both her and her daughter. He is suspicious at first, but after reporting it to an officer (Nick Cheung) he realises he could actually be the only person able to prevent the crime from happening. Chaos ensues, and with chaos comes much entertainment. It's a fantastic, fast-paced Hollywood premise that was used to good affect in the original outing. Not to be confused with quality entertainment you understand, but plenty of lightweight fun was had along the way. Benny Chan takes that simple premise and raises the bar higher. It's still daft, it's still relentless and it's still a whole world of fun. The first act sets the scene well enough, but it's not until the opening car chase that we start to realise just how much fun the premise could be. I just hope Bob took out some phone insurance, the mobile in question must be the most resilient cell phone in the history of cinema. Connected rarely let’s up from here on in. A recent review compared Louis Koo’s performance to that of Scrat from the Ice Age series, and he's not far wrong. It's a wide-eyed performance for sure, but it never threatens to derail the movie because it fits the tone of the picture perfectly. Chris Evans always looked as though he was a Hollywood action star playing the part of an American family man. Not so Louis Koo; he looks pretty damn pathetic all the way through. He cries, he screams, he whimpers, he deals with every situation in the least heroic way imaginable, and he's all the more likeable for being such a wimp. Nick Cheung is the heart and soul of the movie, a down on his luck cop who gets it right every time. He’s the workingman’s man, doing what it takes to get through the day, and it's his performance that keeps the film from bouncing into the stratosphere. Benny Chan (New Police Story, Rob-B-Hood) proves yet again that he’s more than capable of delivering a solid Hong Kong action movie. The pace never lets up, delivering the kind of thrills you would expect from such a farcical set up. Had somebody asked me which American movie I would like to see remade by Hong Kong filmmakers, Cellular would never have crossed my mind. 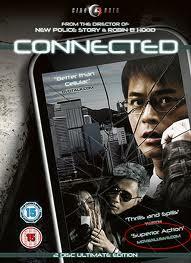 But as it turns out, Connected is the kind of movie the Hong Kong film industry use to make in its sleep. Jackie Chan was usually attached but hey, you can't have everything. Connected is one of the most ludicrously enjoyable movies I have seen. It doesn't qualify as art, but I know that, after a few beers, this is exactly the kind of movie I like to unwind to.